Reminiscent of family Heirloom Silverware, this fork, knife and spoon are formally arranged for their "place setting" on the chest of any color apron you choose. You will be selecting the embroidery thread color as well. A simple whimsical look can be created with a vibrant shade of lime green or violet embroidered on a berry colored apron. Or create an elegant designer classic with silver thread on either a black or white apron. The apron is a traditional bib, covering and protecting your chest and waist from culinary mishaps. The neck tie can be shortened or lengthened by means of an adjustable slider. The fabric is a durable poly/cotton blend, treated with soil release technology. A large center-divided patch pocket serves as convenient storage for restaurant wait staff or just a hand place to tuck your kitchen towel so it's always within reach. This apron will be personally crafted for you based on your color specification. Please allow 5-7 business days for customization plus shipping times. Please note that embroidered items are not returnable, and we welcome the opportunity to assist you with questions prior to placing your order. 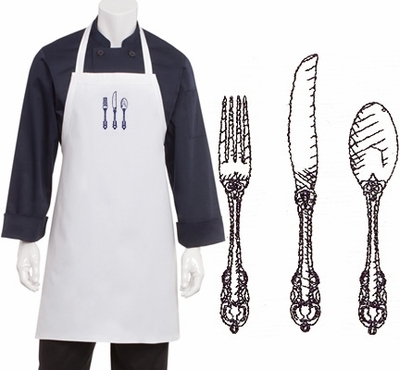 On the Designer Silverware Apron, Rina says: "I was recently contacted by the awesome folks over at The Chef's Emporium. They happen to have these adorable aprons in a gazillion colors, and oh, you can have them personalized any way you want to! How cool is that? It was way cool because I got this adorable apron made up and shipped to me. I will no longer have little splatters of god knows what on my shirts. We have all had them. So I now have this cute apron with an awesome design I got to pick myself, right down to the font I might add. So if you are in the market for an apron or even kids chef coats which are adorable to, check out The Chef's Emporium." I give thee . 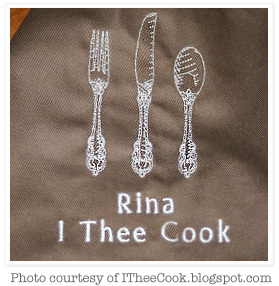 . . "I Thee Cook", a cooking blog. "Why the biblical title? ", I ask myself upon first entering the site. The front page greets me with damask linen and a perfect golden sear on a NY Strip Steak, elegantly toped with glistening Horseradish Compound Butter, and a side serving suggestion of Baked Potatoes and Steamed Snow Crab. Is this going to be one of those, step up to the alter and begin the worship service, while a gourmet guru rallies us from the pulpit to a unison chorus of ALL HAIL THE CHEF? Impressing us with post after post of tantalizing recipes that we could not possible cook for ourselves without a four year degree in culinary arts. Sure, I can admit when I'm wrong. After just a few clicks through the archives, I find I'm nodding my head, "yes, oh yes" to the Hot Baked Clam Dip. I offered up a unexpected hallelujah to the genius creation of Buffalo Chicken Lettuce Wraps and bestowed a reverent amen upon the Fully Loaded Baked Potato Soup. This is biblical in a sense - 'cause I THEE COOK, you've just reached my Soul. Quenching its hunger for SOUL FOOD with recipes that are tried and true classics. You craft dishes that bring people together, has them reminiscing the good old times, pleasing palates both young and old alike, and comforting them from the inside out. A note on the cuisine, this blog makes you feel like you've just stepped into your favorite Classic American Diner and walked out with their prized Recipe Box. Then I THEE COOK guides us through the act of recreation with a savory synopsis of the dish, precise ingredient lists, mouthwatering photography and preparation instructions that even a kitchen novice could replicate. Thanks Rina, your I Thee Cook, cooking blog is divine inspiration.